You can make a lot of cool things from trash. And who doesn't have a lot of junk sitting around? My husband always gives me weird looks when I confiscate boxes and used babyfood jars, but I always see the potential for what they could be. I'm not a hoarder, I swear! Half the clothes I make for my daughter are made out of an old shirt that my husband grew out of or a hand-me-down from a friend or family member (see my Button Down Rehab series for proof). I get such a feeling of accomplishment from making something new out of something old (and it doesn't hurt that the projects are practically free either). So when I saw this old garbage bag box, I didn't see trash. I saw a new toy for my daughter. Preferably a larger one with thicker cardboard and a flap already cut in it, like the bulk-size trashbag box I used below (I got it from Sam's Club). Regular cereal boxes and the like won't work as well because they're too flimsy, that's why I like using the bulk cardboard boxes for projects like these. I was also lucky that my box already had the front flap cut out of it. If your box doesn't have this flap, grap a box cutter or X-Acto knife and (carefully!) cut a flap in the front to look like a mailbox. 2. 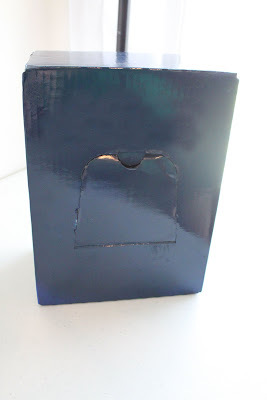 Coat your box with spray paint. All I did was plop my box down outside on some cardboard and coat it generously with blue spray paint (the cheap-o kind) until the entire box was covered. Be careful you don't spray the box too close or the paint will drip. 3. Trace and cut out your letters. I used the words "U.S. Mail" on the sides of my box and "Letters" on the front. If you have a craft cutter, you can always cut out your wording using adhesive vinyl or contact paper (which is what I used) and then stick on your box. If you don't, just type up your wording, print out, then trace your wording onto the back of your contact paper and cut out carefully with an X-Acto knife. 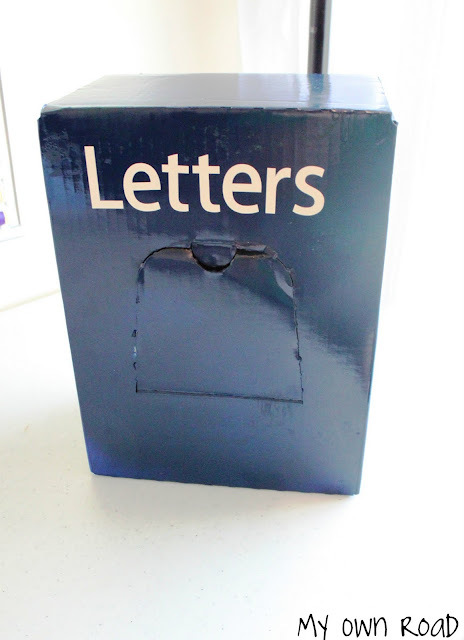 After your letters are cut out, peel off the backing and stick them to your box. Step 1: Trace your mail shape. You can either find an object to trace for your play mail or make a template yourself out of cardboard. Trace 1 shape each on 1 of each color of felt (you'll be placing one piece of felt on top of the other in a minute, so you only need your shape on one). Step 2: Sew your 2 sides together and cut out. 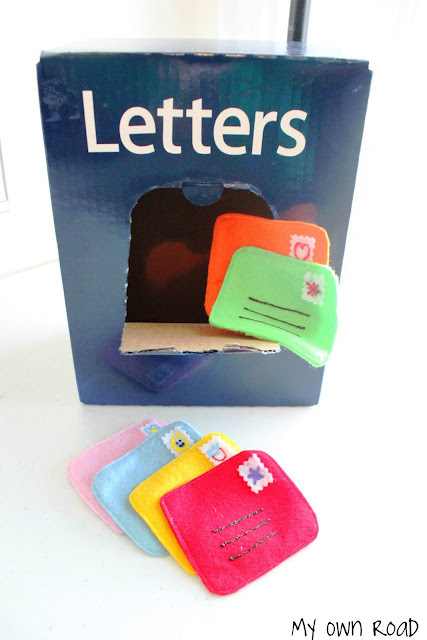 Using a straight stitch and coordinating thread, place the one piece of felt you drew your mail shape on on top of the other piece of felt and pin if you want. Stitch around the perimeter of your shape, backstitching at the end. Carefully cut out your mail about 1/4 inch outside of your stitched lines. Step 3: Add address lines. 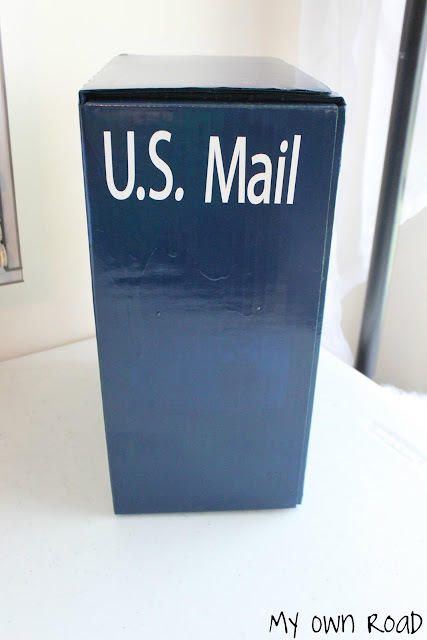 Using your fabric paint, squeeze several lines on your mail roughly where your name and address lines would be. Let dry according to the bottle's instructions. Step 4: Make your stamps. Using pinking shears, cut out 1-inch squares from white felt. Using a glue gun, attach your stamps to your pieces of mail. My daughter loves getting the mail with Daddy, so now she has her own little mailbox that's just her size. Jen, what a cute project! I can see a lot of things to do with the mail, like some embroidery would be cute, too. Great idea, girl! What a fun idea! Now she needs a little mail man sak to deliver the mail! I have a leftover can of spray paint - might have to make one of these for the grandbaby. Love this! My daughter too loves getting the mail and I think this would be a big hit... Thanks for the inspiration! Oh that is so cute!! Love it!! Love the play mail. Very cute idea. So cute! My kids love to dig in the recycle bin for the best stuff to craft with. I absolutely LOVE this!! I am a new follower from the Sunday Scoop. :o) Looking forward to reading. Oh my! I just made a cardboard mailbox for my daughter's birthday party and am so jealous that yours turned out so much better than mine. I may have to start over :). Thank you for stopping by my blog and allowing me to wallow in misery over my not as cute mailbox hehe. Definitely joking but seriously, nice work! Love, love, love this. 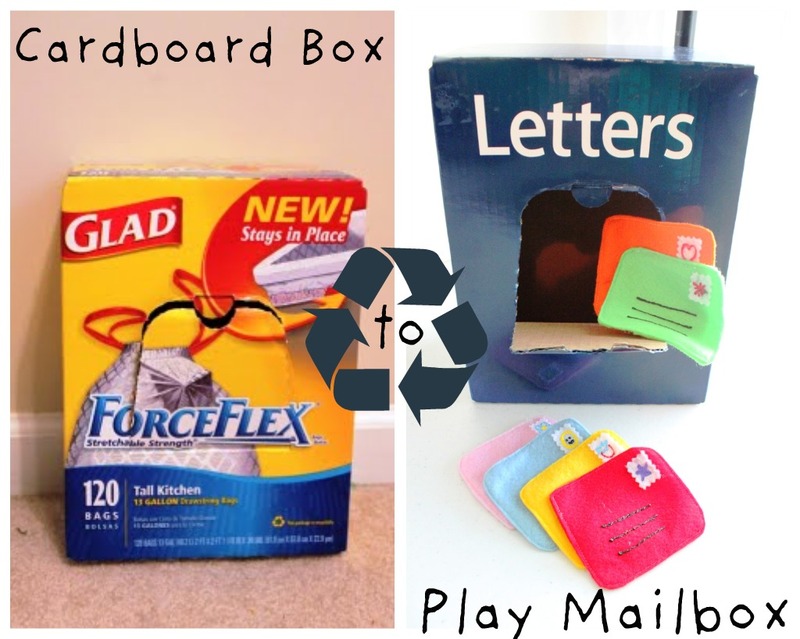 I am so impressed by the things people make reusing cardboard. My boys would have so much fun with this. I love this! So cute!!! I am heading out to dig in the recycling right now to find a good box! This is so cute! I want to make one for my son! My kids love this one too... You just got another STICKER! Perfect little toy! My son will love this! Thanks for the idea! So cute! I love it! Can't wait to make one for my daughter! My kids would love a mailbox like this. it would make a great valentine's box also. 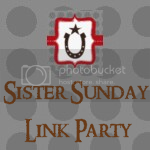 I am featuring this at somedaycrafts.blogspot.com. This is such a great idea! I would love to feature this at Reduce, Reuse, Upcycle. 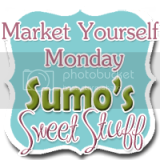 Feel free to stop by and grab a featured button. Thanks! I used the last trash bag the other day and set my box aside for the same thing!!!! I just had to google how to cover it with paint or duct tape. Thinking I'm going to use some left over black rustoleum. Then some left over scrapbook stickers to say "Mail". Thanks!